Get rid of your ugly chrome and amber accents on your BMW M2. This cosmetic package will eliminate all those ugly pieces that come from the factory. 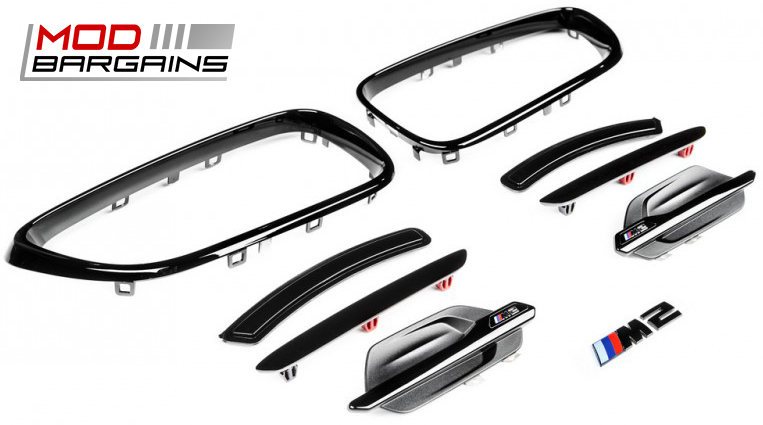 This package will make your M2 stand out from the boring stock crowd, and these will compliment your other black trim prices perfectly. Be different and step out of the stock zone. Don't buy cheap aftermarket parts that aren't built to last. These are 100% OEM, so you know they will have a perfect fitment and are made from high quality BMW parts. This cosmetic package will greatly enhance the appearance of your BMW by eliminating the ugly chrome and amber accents that come from the factory. 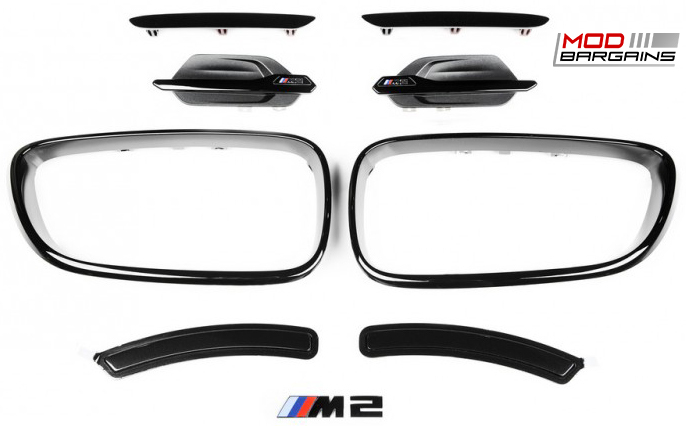 Not only do these pieces compliment your M2 perfectly, but they are made from 100% OEM parts. With this package you don't have to worry about any fitment or quality issues. These are made to last the lifetime of your M2. This package comes with a set of front reflectors, gloss black front grille surrounds, and gloss black side grilles. Rear reflectors and rear trunk emblem are optional. Getting this as a package will also save you money rather than buying them individually. This package will definitely make your M2 stand out from the boring stock crowd, and add a more aggressive look to your overall appearance. You will have everyone second guessing themselves when they pull up next to you on a red light. You'll have them leaking oil by just looking at how much more aggressive your M2 looks. Give your BMW M2 the attention it deserves with this sleek and aggressive cosmetic package.